I read this article and found it very interesting, thought it might be something for you. 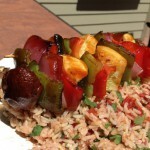 The article is called Summer Vegetable Kebabs over Tomato-Lime-Cilantro Rice and is located at http://www.gardendish.com/summer-vegetable-kebabs-tomato-lime-cilantro-rice/. 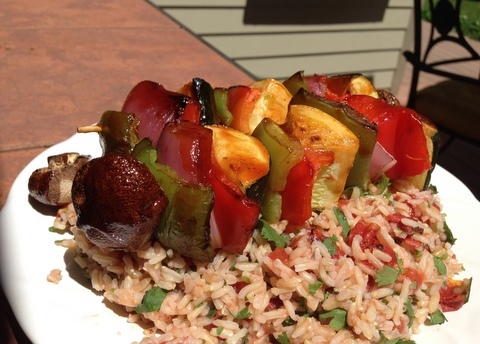 Invite some friends over, put up the badminton net, and serve up these Summer Vegetable Kebabs over Tomato-Lime-Cilantro Rice. A tall glass of something cool and refreshing would be a nice addition. This fun, summertime dish will fill you up without weighing you down, and it’s packed with the flavors of summer like barbecue sauce, fresh herbs, and fresh vegetables. The flavorful Tomato-Lime-Cilantro Rice provides whole-grain starch which will keep you full and satisfied, as only whole, starchy foods can. You can pack even more goodness into the rice dish by adding a can of drained and rinsed beans such as navy, pinto, or black. 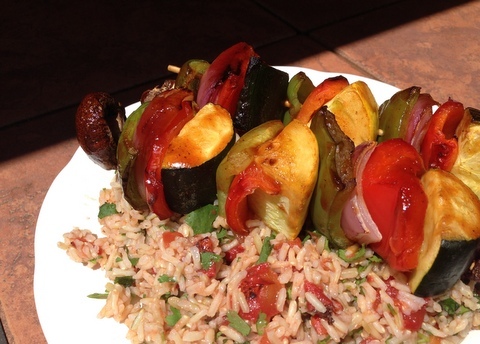 Or try swapping the brown rice with quinoa for an extra special appearance. This recipe starts with already-assembled vegetable kebabs from your local grocery store. You’ll probably find them in the produce section, veggies and fruit on a stick, ready for grilling. We’ve also provided the link to our recipe for constructing your own, if you’d prefer. What could possibly top off this summertime enjoyment? How about thick slices of sweet, juicy watermelon? Or if you’re splurging on calories, try the Summer Peach Cobbler. You’re bound to be the favorite host of summer picnics to come. To cook the vegetable kebabs, follow the instructions on the package of the prepared vegetable kebabs, or use the instructions in Summer Vegetable Kebabs. Meanwhile, gently toss together the ingredients for the Tomato-Lime-Cilantro Rice. 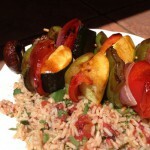 To serve, put a generous helping of the Tomato-Lime-Cilantro rice on a plate and top with 2 kebabs. Nutrition (per serving): 506 calories, 82% calories from carbohydrates, 11% calories from protein, 7% calories from fat, 11.5g fiber.